Ever wonder what a bontified Southern pig pickin' looks like? 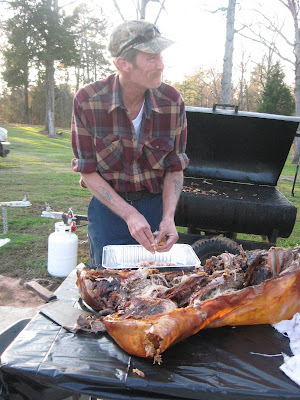 My buddy, Jim, put on one hot pig pickin' last night. Seriously, he pulled out all the stops. I'd have to say it's the best pig pickin' I've ever attended. Great company. Great barbecue. Great sides. Great fun. The guys had two big barbecue smokers going with whole hogs. The front smoker had a butterflied pig. In other words, the pig was split down the middle and put out flat - eastern style. The second smoker had a hole hog complete with an apple in the mouth. I was quite impressed with the whole hog cooker. Note that the grate flips. One of the guys showed me how they could turn the pig with the flip of a lever. Pretty neat especially when I've stuck with smaller cuts like pork shoulders or Boston butts due to the weight of a whole hog. The flip grate would make a world of difference for anyone smaller. Guess I'd still need help hoisting a full pig up on a cooker, but that flip barbecue grate would be excellent. Yum! I can't even begin to describe how good this pork turned out. The guys smoking knew their stuff. The barbecue meat just literally melted in our mouths. Very tender and moist. The barbecue sauce was top notch too. A local fellow, Charles Barber, makes that, and I need to get over and buy some of his bbq sauce. It's as good as any I've had around here in an area where a lot of people make up vinegar based NC barbecue sauce. He's got THE recipe especially his hot version. I do love some hot barbecue sauce. 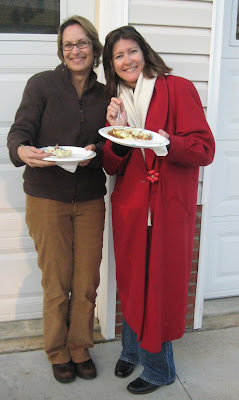 I even loved the slaw, and (shut my mouth) I am not a barbecue slaw fan. This made a believer out of me, and I'm going to have to hit Jim up for his recipe. That slaw absolutely rocked. 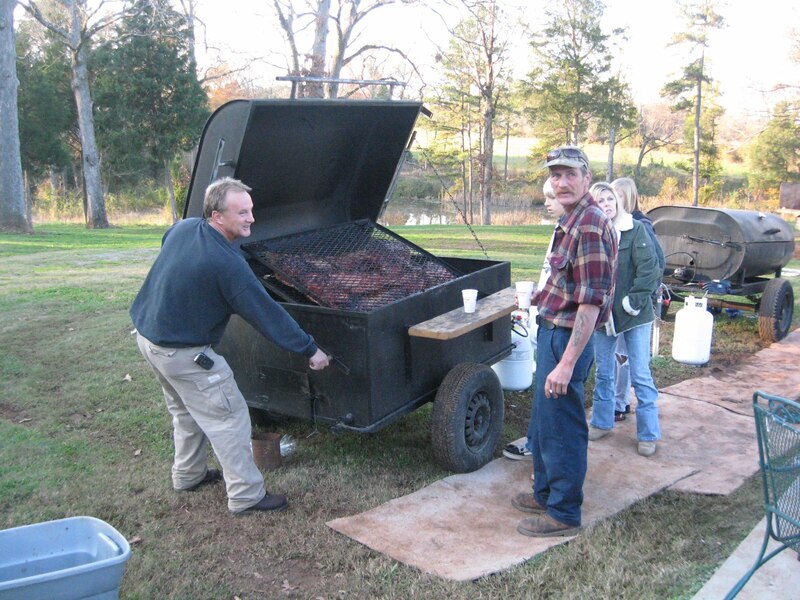 It was the traditional NC red barbecue slaw, but Jim did something that made his really stand out. 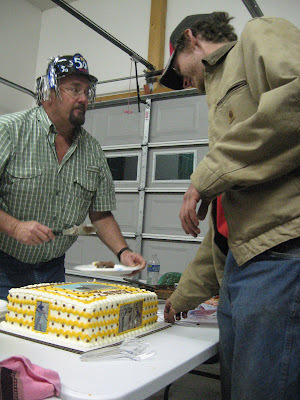 The pig pickin was to celebrate Jim's 50th birthday, and he had a really cool cake with an Egyptian theme, since he just got from Egypt. 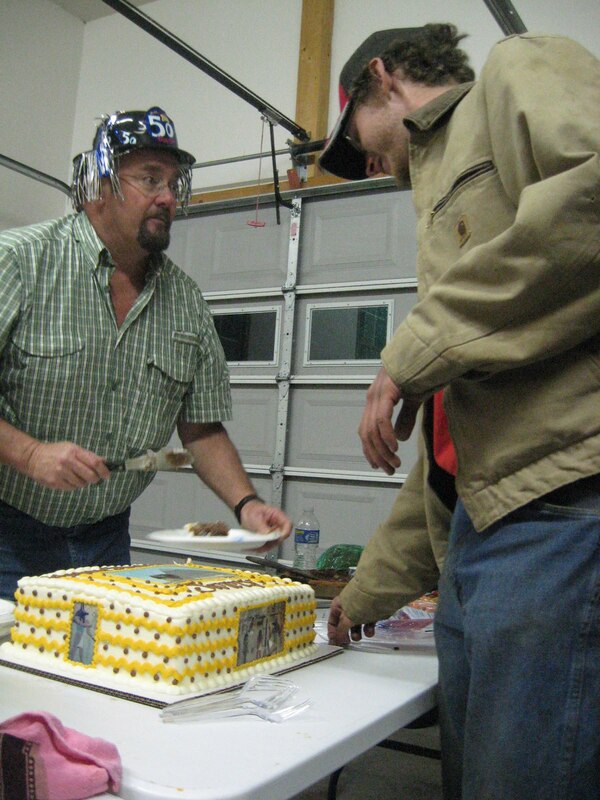 The cake looked great, but I was too full of barbecue to eat any sweets. I forgot that "save room for dessert" once I got to eating that barbecue and the sides. Oh well, maybe next time I'll remember not to eat so much barbecue - or not. 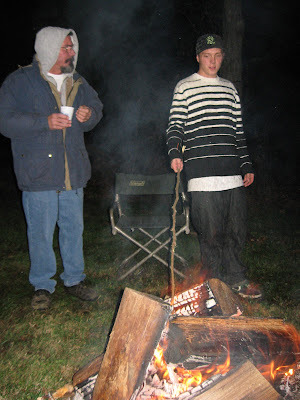 We wrapped up the pig picking with a bon fire around back which felt great, since it was a rather chilly night here in North Carolina. Of course, it is November, but we've had some 70 degree days lately. Not last night though. Not sure how cold it got but cold enough that I wished I'd brought gloves. That's OK though. It was warm up next to the fire, and with this crowd, you get to talking and laughing and forget that it's cold outside. Great pig pickin' Jim - and Happy Birthday!